Liz Bangs-Jones and Alice Osman attended the examination session in Cyprus in June. Over the two days they were there, they visited Limassol, Larnaca, Paphos and Nicosia, observing the administration and delivery of the exams and giving personal attention to candidates with requests for reasonable adjustments. Liz and Alice also spent time with Michael, George, Polis, Katia, Lambros and Pavlas, our excellent representatives and colleagues on the island, as well as taking advantage of the opportunity to talk to the teachers and institute owners and get some direct feedback. As usual, there was a great atmosphere around the exams, a real feeling of a significant annual event with local roads blocked and pavements crowded as candidates and their families arrived throughout the day at the various venues. We are very pleased to be able to include two more institutes of further education to the list of recognised institutions. In partnership with Beijing Bailie University University, Anglia Examinations is establishing a programme of International English teaching for young learners. Our annual event has now been officially launched and it is due to take place on Saturday, 28th October on the premises of Universidad Abierta Interamericana in the City of Buenos. There will be a very special celebration this year as it marks the 20th anniversary of the Kunz Family and their team of collaborators representing Anglia Exams in Latin America. Mexican students from the Language Centre at the Autonomous University of Zacatecas, in the City of Zacatecas, took an Anglia Exam in their own city, for the first time ever. Everyone was really excited about this new experience since having an international certificate will undoubtedly open the gateway to opportunity, in Mexico as well as abroad. Now everyone is looking forward to receiving their exam results as soon as possible, as you can all imagine. This coming June, students from the City of Guadalajara in Mexico will take their Anglia Exams on the premises of Luis Silva School for the third year in a row. Good luck to everyone! Step to Books – Huge Success in Latin America! Immediately after announcing that the Step to Books would be printed in South America, we begun receiving many emails, phone calls, Facebook and Twitter messages etc, requesting copies of the books. As the days went by, the number of academies and schools adopting the books grew larger and larger; to such an extent that the original order we had placed was not enough and we have recently had to order more. No doubt the Anglia Step to Books ARE the way forward as they have proved to be an invaluable teaching resource! 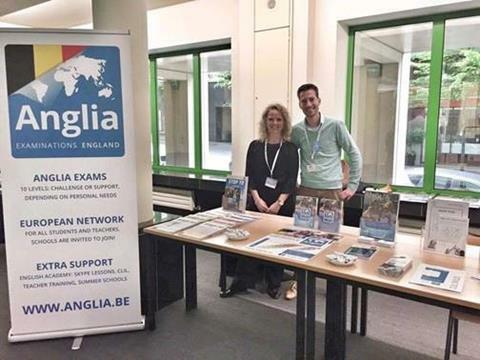 Anglia Netherlands colleagues Katarina Kilibarda and Sander van Haarlem visited the BELTA conference in Brussels to discuss further cooperation between Anglia Netherlands and Belgian colleagues. Teachers were primarily interested in exams, CLIL, High Five and the Ardennes Camp. With June registration of nearly 5,000 Examinations we have easily surpassed the 20,000 mark again this year. 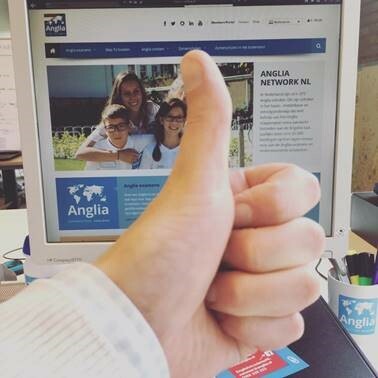 We are very excited to see that numbers are growing and that more and more countries join Anglia.